There have been a lot of rumors making the rounds about the Galaxy S5, but now we finally have what we could consider concrete details on Samsung’s next flagship, including a model number and a few of its specs. A device with model number SM-G900S has made an appearance on GFXBench – the model number suggests it could be the Galaxy Round’s successor, but what reduces the chances of that being the case is the hardware listed in the benchmark. 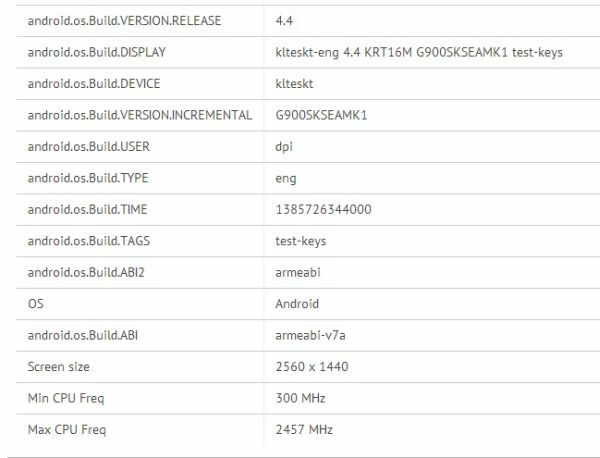 The SM-G900S is running on Android 4.4 KitKat, which isn’t surprising considering Samsung has been at the forefront of launching flagship devices with the latest version of the OS since the Galaxy Note II. 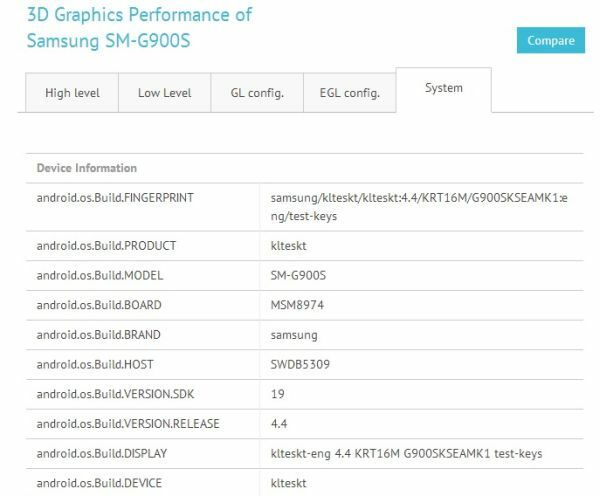 Provided this is the Galaxy S5 we’re looking at, its appearance in benchmarks at this time doesn’t come as a surprise – numerous reports have suggested Samsung is planning on launching its next flagship in the first quarter of 2014, so it would be normal for the company to be testing the device in full force and effect. What do you guys think? Is the SM-G900S the Galaxy S5? Actually, there’s a very high possibility it is, so the real question is: are you impressed by the hardware it will apparently sport, and does it do anything to increase your impatience for Samsung’s next premium offering, one that might finally be made of metal instead of cheap plastic? I applaud Samsung for pacing technology leading the way to providing the products we must have over time. Plain and simple nothing beats Samsung period. I agree with you Richard. Imagine if it was only crApple. Things would be very boring in the smartphone arena. Samsung is where the innovation is at. They keep pushing the envelope. I can’t wait to see what the future brings. I hope they wait a little and use the next generation Snapdragon 805 Ultra HD, so there will be no need to launch a “new version” of Galaxy S5 to compete with the new smartphones that will be launched with that new chip.